Shruti's Blog: The vagaries of the vegan cat! “Baby, have I forgotten anything?” finishing the grocery-shopping list, I ask Baby. “ Gingerr fooddu!!! Kyaa maydum! Bhool gaye kya, Maydum!“ Baby reproached me in mock shock. I stand adequately admonished. Yes, how could I forget to bring the cat’s food. He would eat nothing but the ocean fish flavour and then again, only from Whiskas! He would go hungry for hours, but one sniff of the proteiny smelly dry granules and he would know it wasn’t his brand! Looking at the milk-filled sweet corn on the cob that I am peeling for the corn pulao I have been planning to make for a while, I wistfully remember Ginger, my girls’ first pet cat, who ate nothing but vegetables for the first two years of his life. Yes. Vegetables. It may not seem funny to people watching cat videos by the millions today. But it surely amazed us and everyone who heard about it, that the orange tabby’s comestibles comprised cooked veggies like carrot, pumpkin, peas, beans, gourds. Not to forget raw cucumber and tomato- he would come running from land’s end on hearing the scrunch of the slicing of cucumber and the slurpy chopping of tomatoes. Boiled or roasted corn on the cob found special favour with him. One would have thought, being a vegetarian cat and missing out on sinking his fangs into flesh, he would like to sharpen his canines on the cob. But no- not for him the pedestrian gnawing on bhuttas- he liked to be handfed kernels of the sweet corn. However, oxymoron that he was, Ginger kept his eyes peeled for leathery pumpkin, papaya and potato skins. As he grew into a young cat, he would periodically disappear from home - for a few hours or sometimes even days- on amorous pursuits. During these ‘blackout’ times he would mess up with other tomcats. These alley cats, having been raised and nourished on the dumpsters overflowing with the excesses of the meat-eating denizens, were much stronger and tougher than him. His prodigal return, invariably as a wounded soldier with fresh or festering gashes often required antibiotic treatment. I would give him a course of amoxicillin titrated from the contents of a capsule. How would he ingest the bitter powder? Easy! The miniature dose of antibiotic was stuffed into a small piece of fresh Omani date and the funny feline would gulp it down happily! When dinner was served, I would say, “Chala”, meaning, “Come on, let’s eat”. The first one to be seated at the table on his designated chair beside me would be Ginger! And he would not be sated until he had been fed ALL the peas, carrots, French beans, pumpkin and potatoes on my plate. He was partial to moth and mung lentils, beans and chickpeas, but environmental and bad breath concerns blew so big that he was banned the beans! Ginger’s vegetarian fad came to an abrupt end one day in his third year, when professional solicited advice and unprofessional, unsolicited guilt and family pressure at perhaps depriving the obligate carnivore of the ‘natural’ foods of his species eventuated in his crossing over. The minute he went back into the feline fold, he became fussy, finicky about food- the brand, the flavour, the mealtime, who fed him, the dish in which he was served…. A thousand memories- but Ginger is best and most fondly remembered for his vegan vagaries! 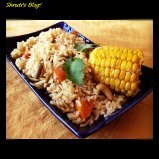 Yes- the corn pulao- I have been meaning to experiment with the cobs stewing in the juices of the pulao and contributing its fragrant flavours to the rice in return! In a heavy bottomed pan, heat the oil or ghee and add the shahjeera, bayleaf and cinnamon piece. When the seeds crackle and the leaf and the bark browns, add the cashews, sliced onion, slit chilies, and onion and ginger pastes and fry. Add the garam masala, vegetables, corncobs and stir. Drain the rice and add it to the mixture, stirring gently to coat the rice with the spice and vegetable mix. Add about 4 cups of boiling water, cumin powder and salt to taste. Add the lemon juice and adjust all the tastes. Cover and cook till done. Rest for a few minutes. Serve hot with a raita or curry. Make sure to serve a piece of corn with every serve!